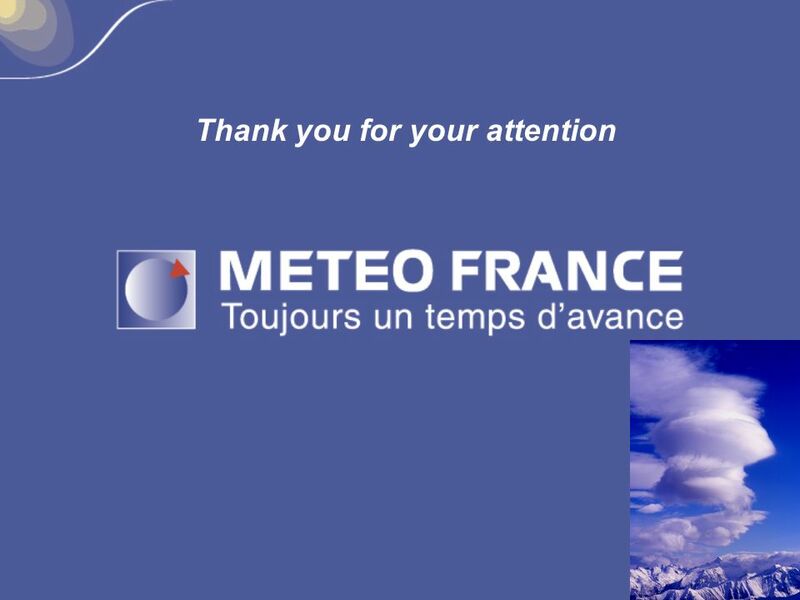 Beyond the short range (24 H) at METEO FRANCE No equivalent oper. 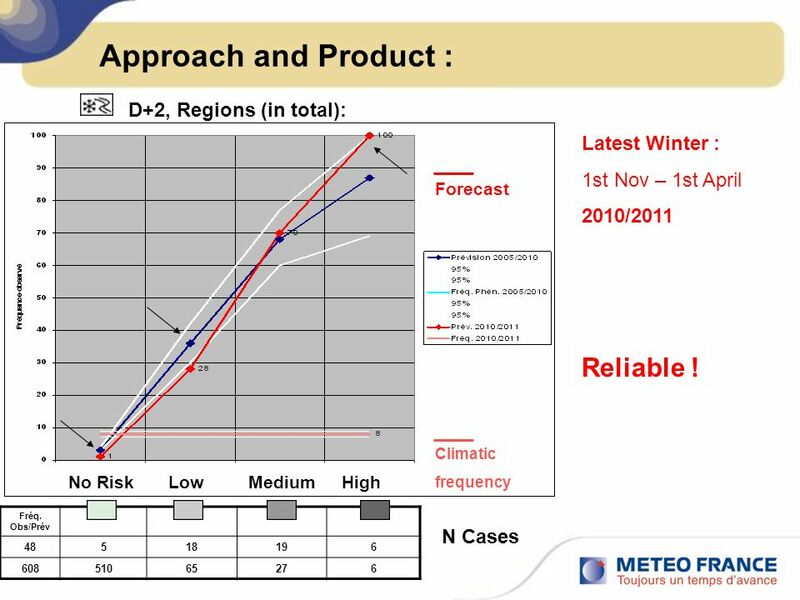 warning procedures available (not yet…) NWP improvements during recent years « Predictability » => Express uncertainty Xynthia windstorm : 3 days in advance ! Definition : orange or red level, “Vigilance” procedure, 24 h ahead. - Violent winds, - Heavy rains *, (not floods). - Violent thunderstorms, - Snow/Ice. (not temperatures). 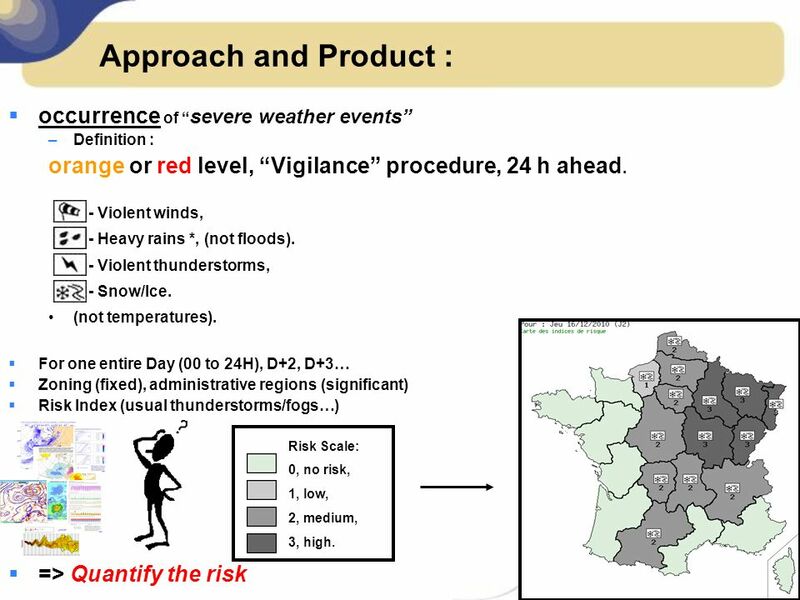 For one entire Day (00 to 24H), D+2, D+3… Zoning (fixed), administrative regions (significant) Risk Index (usual thunderstorms/fogs…) => Quantify the risk Risk Scale: 0, no risk, 1, low, 2, medium, 3, high. 4 Approach and Product : In the past, (CNP -National Service- : December. 2004, ¼ de France). Reference/”truth” data : “Vigilance” level . Example : How much is a “low” risk (1), Over the north-eastern regions, Parameter D+2 ? 5 Approach and Product : In the past, (CNP -National Service- : December. 2004, ¼ de France). Reference/”truth” data : “Vigilance” level . 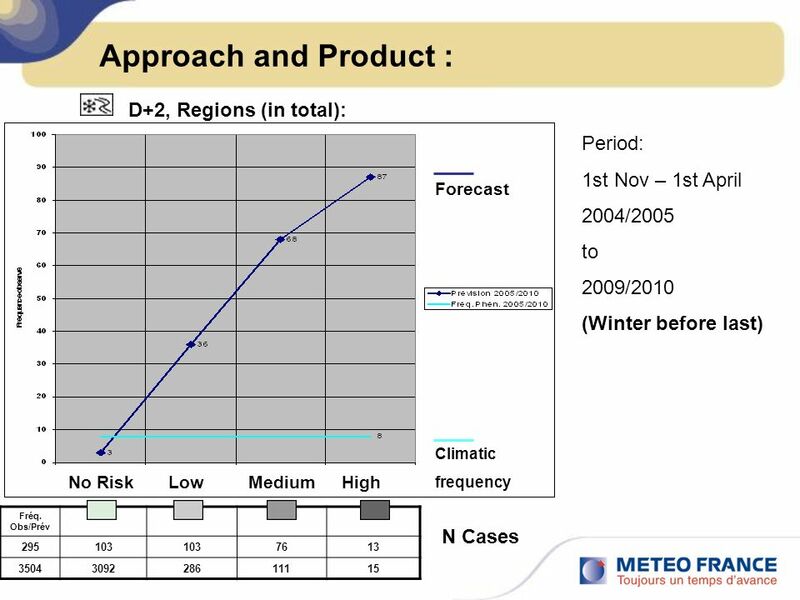 Example : How much is a “low” risk (1), Over the north-eastern regions, Parameter D+2 ? 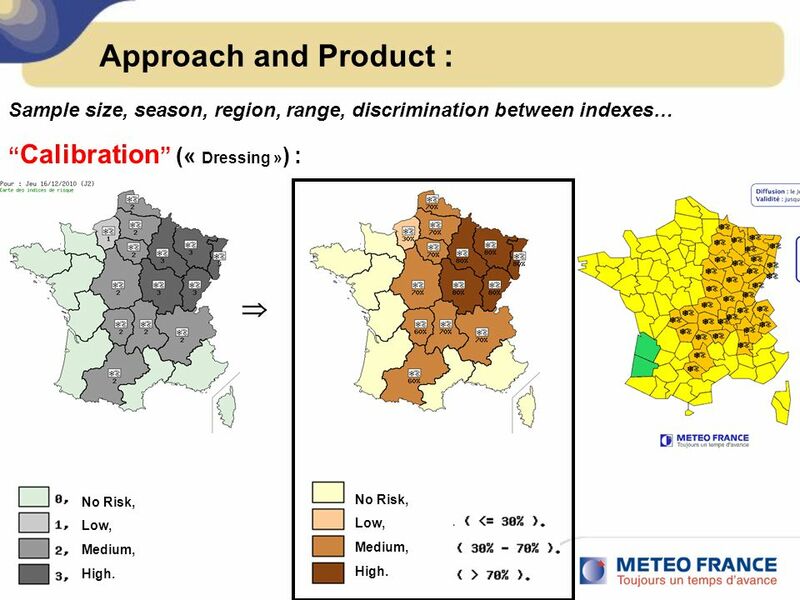 Sample size, season, region, range, discrimination between indexes… “Calibration” (« Dressing ») :  No Risk, Low, Medium, High. No Risk, Low, Medium, High. 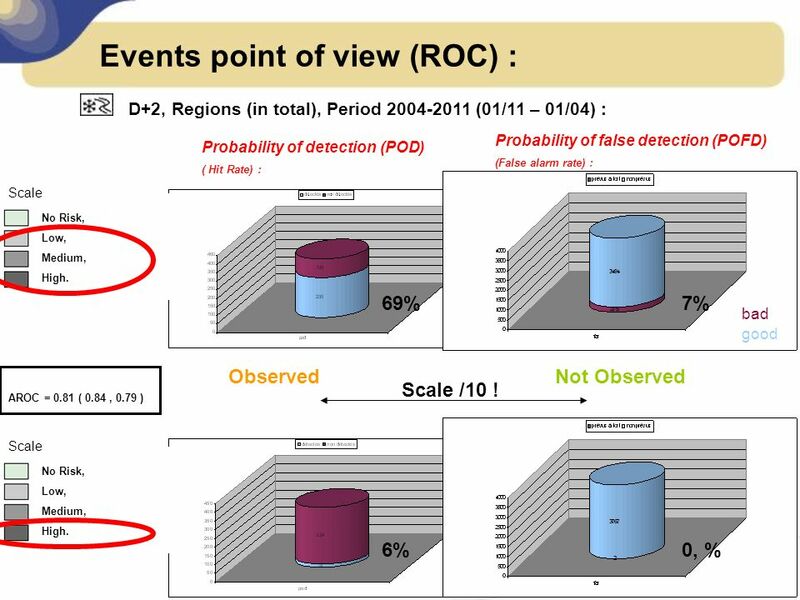 D+2, Regions (in total), Period (01/11 – 01/04) : Probability of false detection (POFD) (False alarm rate) : Probability of detection (POD) ( Hit Rate) : Scale No Risk, Low, Medium, High. 69% 7% bad good Observed Not Observed Scale /10 ! 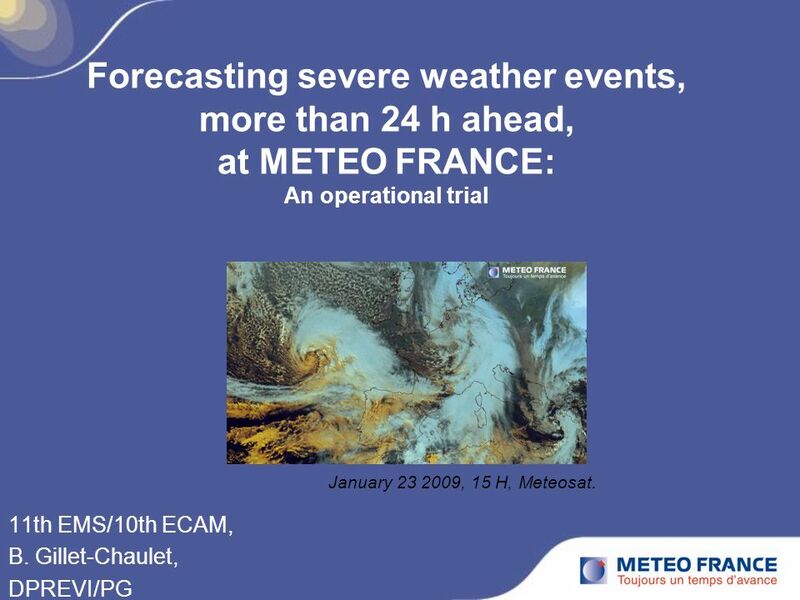 19 Abstract: Title : Forecasting severe weather events, more than 24 hours ahead, at METEO FRANCE: An operational trial. For the short range, typically 24 hours ahead, severe weather forecast procedures have been in effect for a long time. 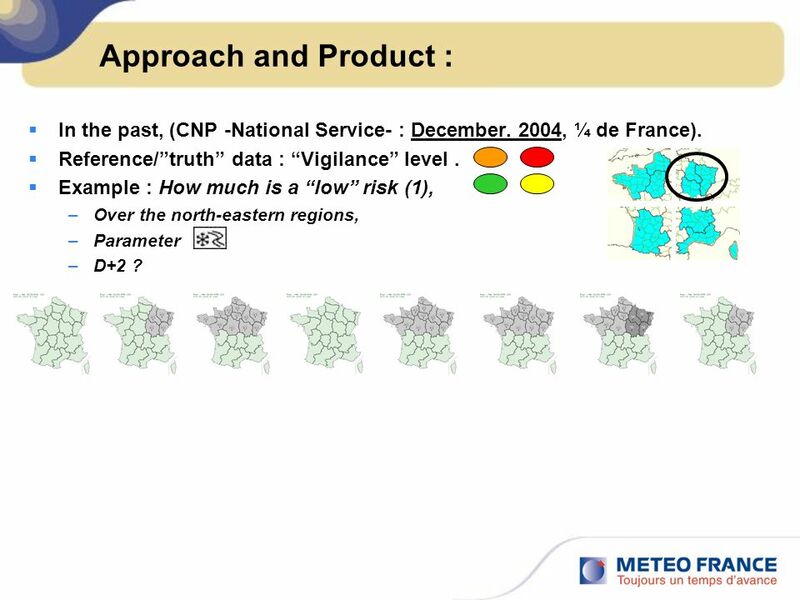 The French “vigilance” watch map celebrates its tenth anniversary in It puts in concrete form the first mission of METEO FRANCE in the domain of protection of people and goods, and has proved generally successful. 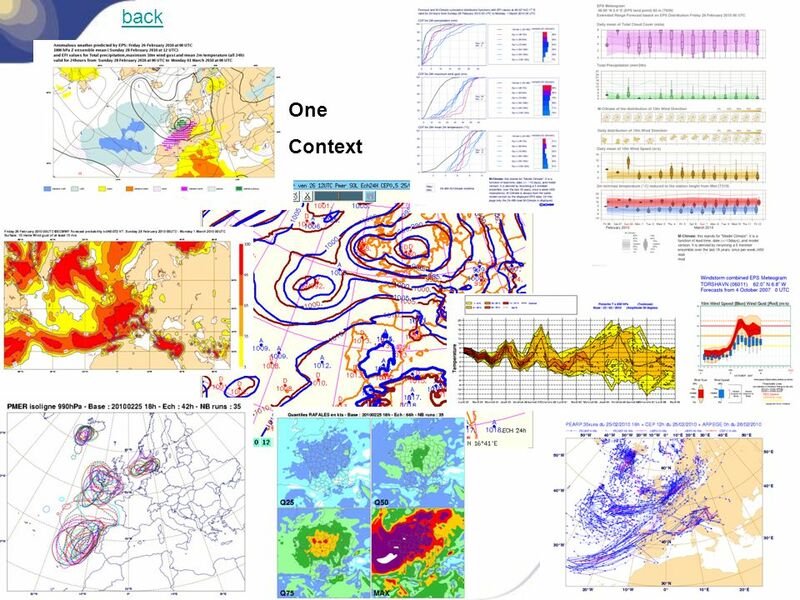 Improvements in numerical weather prediction during recent years, now enable a focus on forecasting dangerous weather phenomena at longer ranges (e.g. within the Medium Range) and beyond the requirements for triggering a “vigilance” warning. 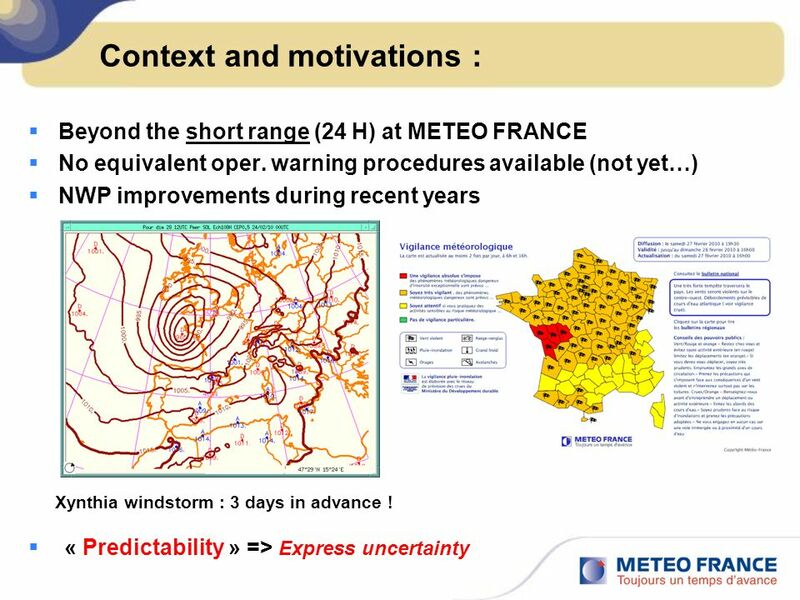 However, this can not be just a simple extension of the validity of the vigilance watch map, because uncertainty generally quickly increases with the forecast range and makes a deterministic approach difficult. 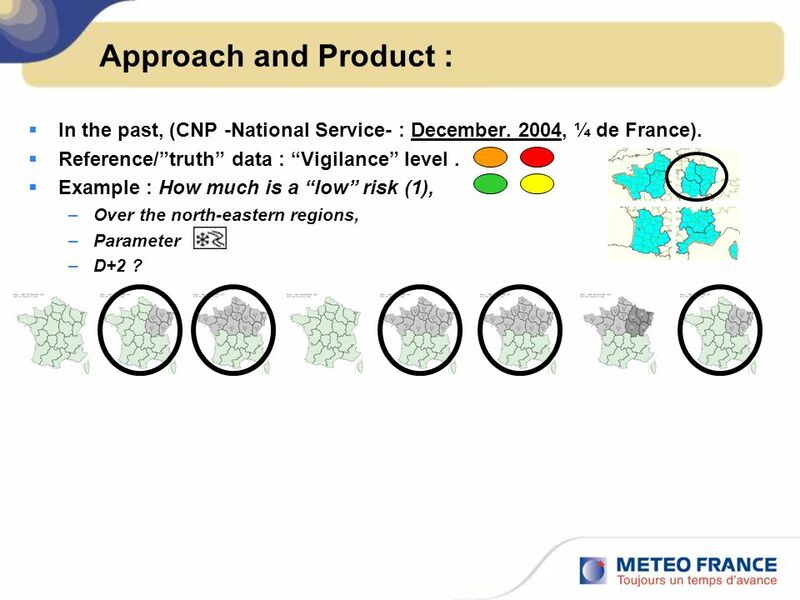 A systematic production, experienced on a daily basis since December 2004 at the national forecasting service of METEO FRANCE has tried to forecast the risk of occurrence of dangerous phenomena (violent winds, heavy rain, violent thunderstorms, snow/ice) that might reach orange or red warning levels of “vigilance”, several days ahead. 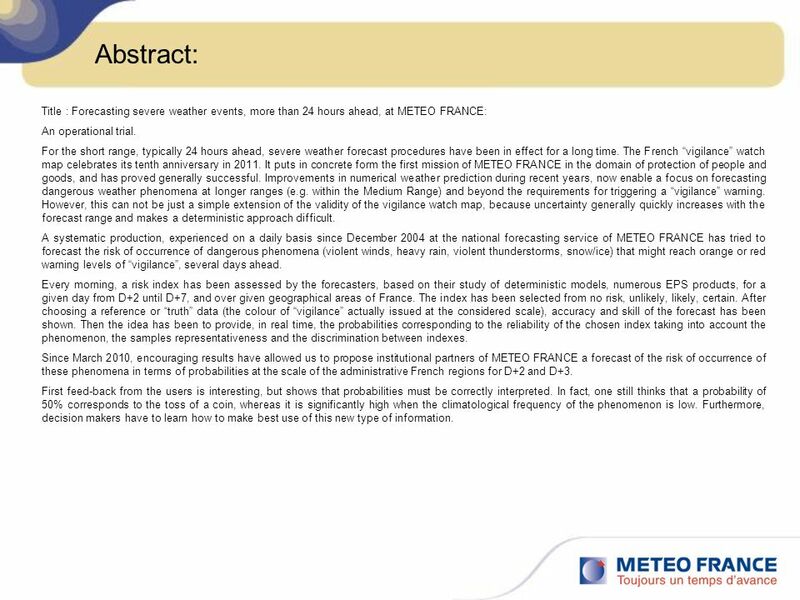 Every morning, a risk index has been assessed by the forecasters, based on their study of deterministic models, numerous EPS products, for a given day from D+2 until D+7, and over given geographical areas of France. The index has been selected from no risk, unlikely, likely, certain. 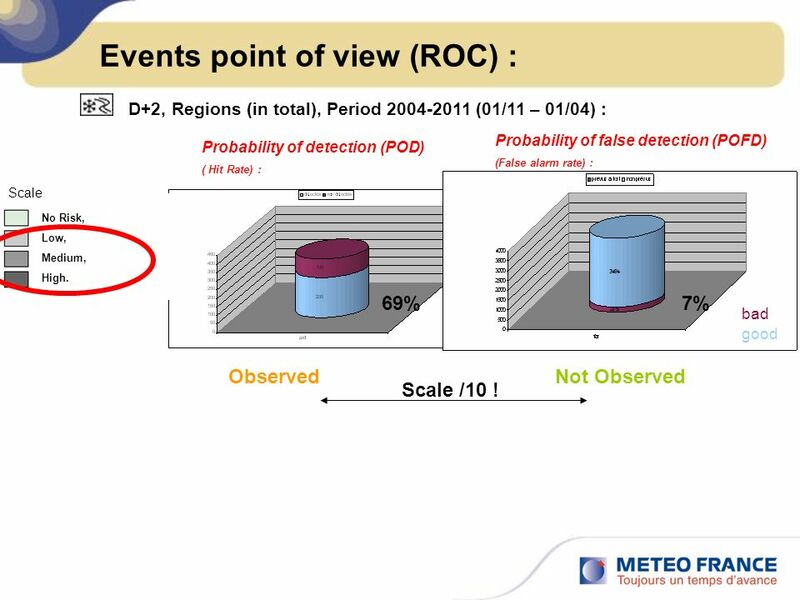 After choosing a reference or “truth” data (the colour of “vigilance” actually issued at the considered scale), accuracy and skill of the forecast has been shown. Then the idea has been to provide, in real time, the probabilities corresponding to the reliability of the chosen index taking into account the phenomenon, the samples representativeness and the discrimination between indexes. 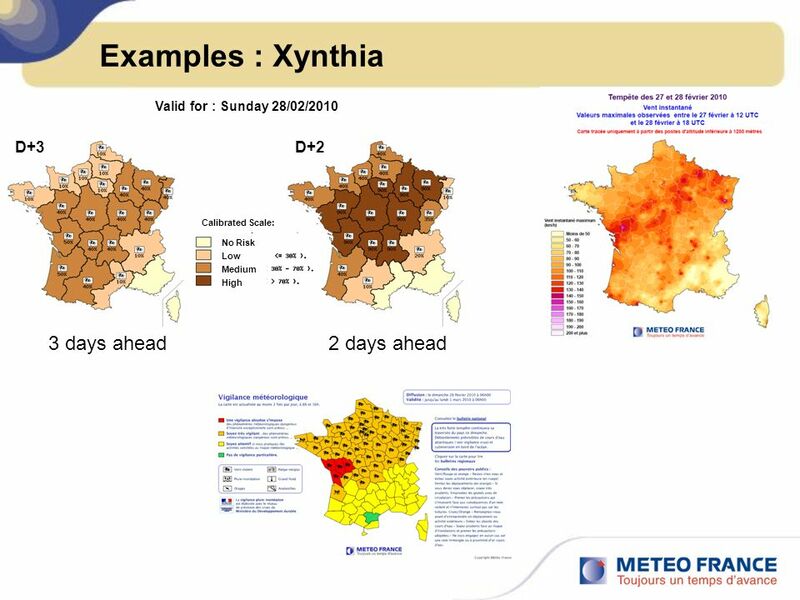 Since March 2010, encouraging results have allowed us to propose institutional partners of METEO FRANCE a forecast of the risk of occurrence of these phenomena in terms of probabilities at the scale of the administrative French regions for D+2 and D+3. 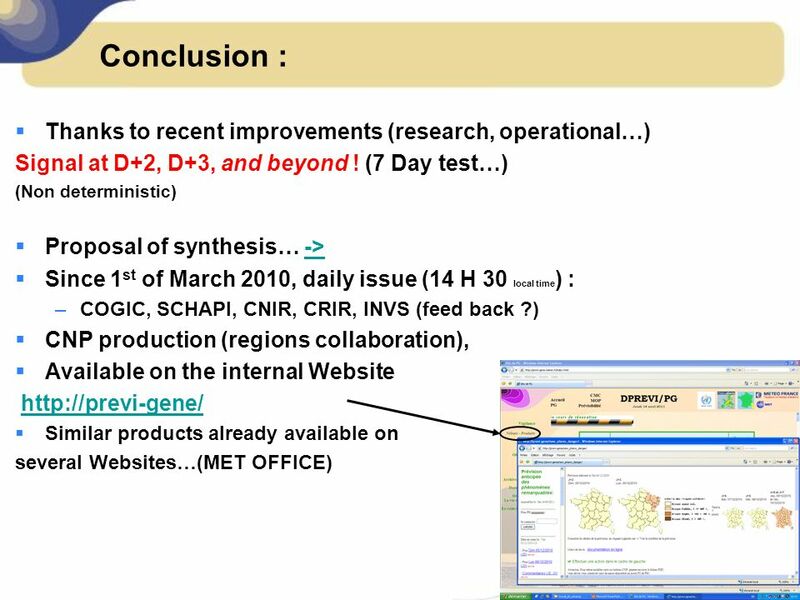 First feed-back from the users is interesting, but shows that probabilities must be correctly interpreted. In fact, one still thinks that a probability of 50% corresponds to the toss of a coin, whereas it is significantly high when the climatological frequency of the phenomenon is low. Furthermore, decision makers have to learn how to make best use of this new type of information. 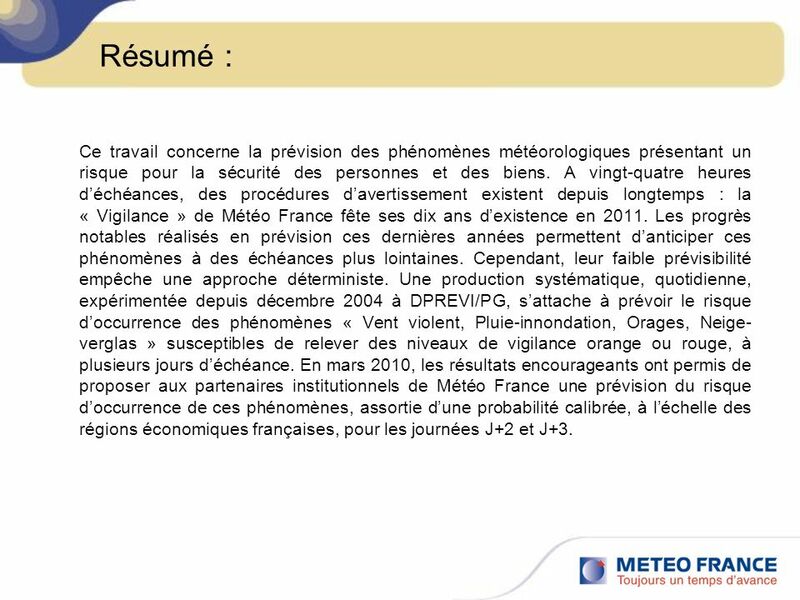 20 Résumé : Ce travail concerne la prévision des phénomènes météorologiques présentant un risque pour la sécurité des personnes et des biens. 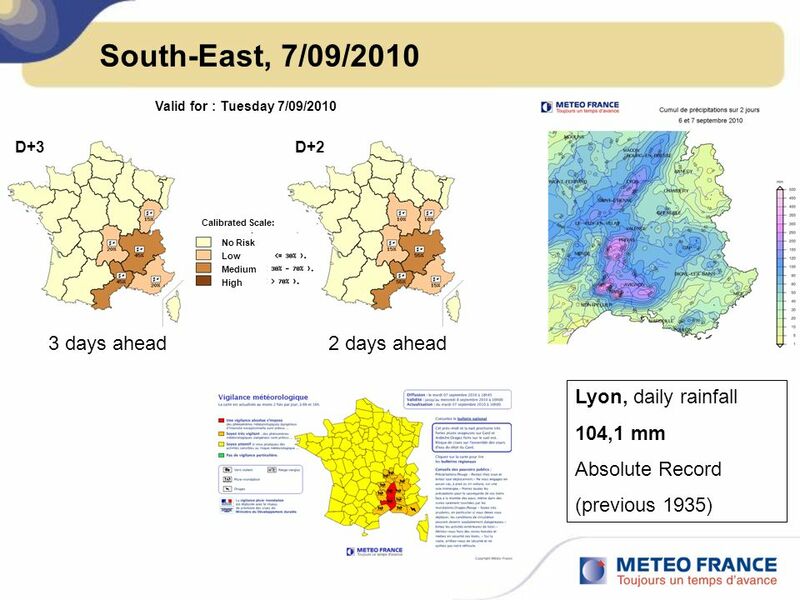 A vingt-quatre heures d’échéances, des procédures d’avertissement existent depuis longtemps : la « Vigilance » de Météo France fête ses dix ans d’existence en Les progrès notables réalisés en prévision ces dernières années permettent d’anticiper ces phénomènes à des échéances plus lointaines. Cependant, leur faible prévisibilité empêche une approche déterministe. 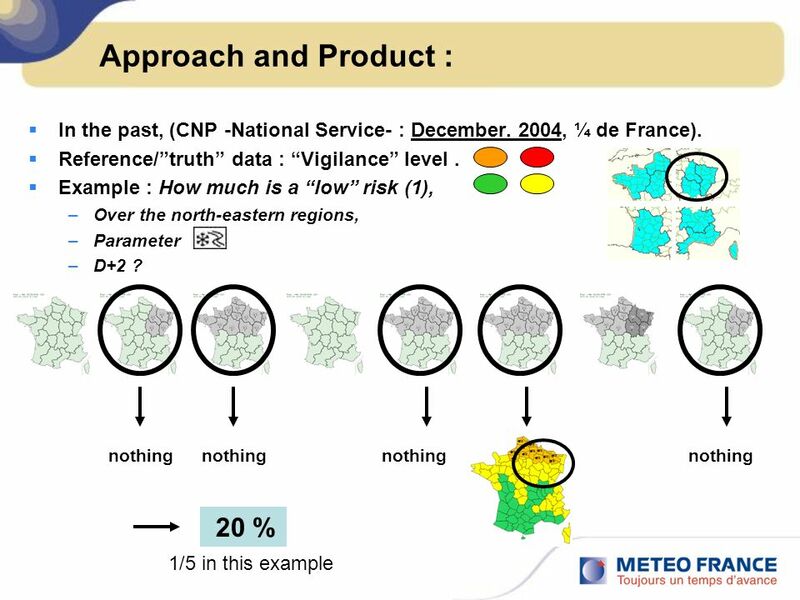 Une production systématique, quotidienne, expérimentée depuis décembre 2004 à DPREVI/PG, s’attache à prévoir le risque d’occurrence des phénomènes « Vent violent, Pluie-innondation, Orages, Neige-verglas » susceptibles de relever des niveaux de vigilance orange ou rouge, à plusieurs jours d’échéance. 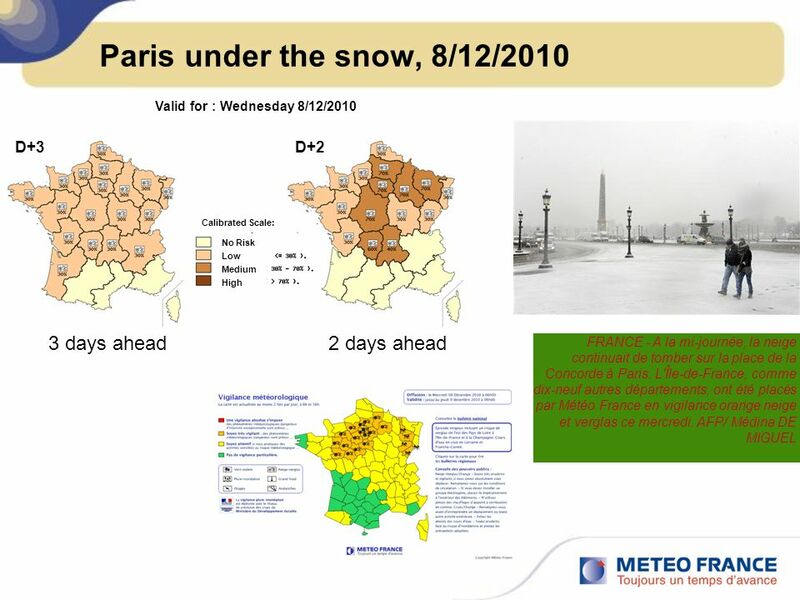 En mars 2010, les résultats encourageants ont permis de proposer aux partenaires institutionnels de Météo France une prévision du risque d’occurrence de ces phénomènes, assortie d’une probabilité calibrée, à l’échelle des régions économiques françaises, pour les journées J+2 et J+3. Télécharger ppt "11th EMS/10th ECAM, B. Gillet-Chaulet, DPREVI/PG"
Title of topic © 2011 wheresjenny.com 1 Grammar Point Duration of time: For, since, and ago. lexpression de la durée. Communications pour le Voyage détude à Strasbourg (29-31 mars 2009) / Information about the study trip to Strasbourg (29th-31st March 2009) Château de. Its all about « mois », the « months » that are important! Defence R&D Canada R et D pour la défense Canada Novel Concepts for the COP of the Future Denis Gouin Alexandre Bergeron-Guyard DRDC Valcartier.